No, you haven't travelled back in time. This isn't the year 2000. 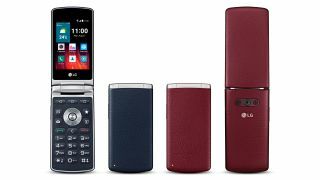 It's 2015 and LG has just launched a clamshell phone in the form of the LG Wine Smart. Announced in Korea under the moniker LG Gentle earlier this year, the Wine Smart is making its way out of LG's homeland and landing in countries including France, Italy, Poland, Spain, Japan and the UK. So apart from a design which will leave you yearning for our simpler mobile past, what else do you get? There's a 3.2-inch, 480 x 320 touchscreen, 1.1GHz quad-core processor, 1GB of RAM, a measly 4GB of internal storage and a microSD slot. Of course, with a screen that small you'll be unlikely to download many apps or games - even though the LG Wine Smart is running Android 5.1.1 Lollipop - so the internal storage shouldn't cause too many issues. The small internal storage is joined by a couple of cameras which could easily be plucked from a phone eight years ago with a VGA front snapper and 3MP rear offering. It's a chunky monkey too, with the Wine Smart set to make a sizeable bulge in your pocket thanks to its 16.6mm depth. The specs aren't really a deal breaker though, as you'll be buying the phone for its clamshell flip action. It's not as powerful as a Samsung Galaxy S6 or iPhone 6, but it'll likely turn more heads down the pub. Exact details surrounding the LG Wine Smart release date and price are yet to be announced.